This set is many things. Its a wry, ironic look at some of the more silly aspects of Doctor Who, its an exploration of the aftermath of an awful Universe spanning time smashing war (sound familiar?) Its a silly superficial romp on the surface but with an incredible amount of depth that will reward the discerning listener as they spot the clever lines, references and pastiches of the Doctor Who we know and love but that have necessarily been skewed off kilter to take into account that we are in a whole new Universe. OK, sit at your desks and turn your papers over, you have one hour. No really of course, but now that you are all caught up – David Warner eh? Fantastic casting and a fantastic take on the Doctor – curmudgeonly, sardonic, sarcastic but something of the grand wizard about him a sort of Colin meets Hartnell meets Capaldi but not really – Mr Warner is very much his own Doctor. But how does he interact with the force of nature that is Professor Bernice Surprise Summerfield? When the Universe is coming to an end the only thing that seems to have any value is knowledge. There is one vast Library left in the Universe and it is drawing in the great and the good – the Sisters of Saint Beedlix led by their Mother Superior (Rowena Cooper) in search of the lost hymns, The Sage of Sardner (Guy Adams) and the Doctor & Benny. It also attracts the unwanted attention of the Kareem – a rag tag band of space luddites who believe that all knowledge is evil and that the Library must be destroyed. Add to this the traditional “body being discovered by The Doctor and him being caught discovering the body and being accused of the murder” and you have a pretty standard traditional Who tale. In fact you don’t – what this set does very very well is take the trappings of a typical Who story and turn it on its head – it may not be for everyone but this is a set of stories for listeners who like their stories with a lot of layers and levels of complexity that are there if you want to delve deeper. It also has singing nuns so what isn’t there to like???? Planet X is a “B” movie sci-fi staple – in this case it isn’t (again) Planet X is called Planet X because it is so dull that they couldn’t be bothered to think of a name for it. Benny is reluctantly taken there by The Doctor – and yes it is dull. But there is a sinister edged to the dullness – the dull mediocrity is enforced lethally by the Government headed by Prime Minister 470 (Julie Graham) – those who show any spark or promise are conveniently “disappeared” as they represent a threat to the social order of utter blandness. Tyranny comes in many forms and the Doctor being the Doctor decides that enough is enough. Warner is on top of his game in this episode, his verbal sparring with the Prime Minister is a joy to hear. In a funny way this is reminiscent of the TV story “The Happiness Patrol” but painted in shades of grey and beige rather than glitz and gaudiness and an interesting take on the “Doctor destabilises a whole regime” style of story. In Doctor Who, when a planet seems idyllic it usually isn’t. In this story the planet in question is Tramatz, and it seems, well, idyllic so obviously isn’t. Not at all. In any way. The Doctor has been on Tramatz for a while enjoying the singing rivers, the emerald forests, the Unicorns and the tranquility. There is a space fleet orbiting Tramatz sending messages and threats to the population – Fleet Admiral Effenish (Deirdre Mullins) pleads with the population to respond or she will be forced to take lethal action against Tramatz. But why? Why does she need to do this, why cant the population hear her, and why CAN Benny hear her and WHAT is the “very dark thing” that everyone can see but no one wants to admit is there? This is a classic, a grade A cast iron classic. Not to everyones tastes, there may be some who dismiss it and miss the point but this story is all about imagination. Because sometimes to quote Love & Monsters “we forget because we must” – in fact this has a very “Love and Monsters” feel about it a multi layered story told from different angles and viewed in completely different ways once it has been experienced. What begins as a trip to fantasy land ends with a sense of regret and melancholy that is justified. Highlight of the box set. At the end of the Universe, everyone goes to the shops – to the emporium at the end of the Universe where large amounts of cash or the sale of some of your memories will buy you a lottery ticket and a chance to escape to another Universe. Presiding over the shop is “The Manager” played by “Sam Kisgart” actor extraordinaire with a CV stretching back to the 1960’s – its well worth listening to the extra features for an exclusive interview with this most elusive of thespians. Of course the Manager is a pretty rubbish pseudonym for this universe’s version of The Master and the Emporium is the latest in a convoluted series of schemes to keep himself alive at the expense of his shoppers. New writer to Big Finish Emma Reeves really knows her Who, fans will delight in her use of dialogue from the series within the confines of the story. Its a totally off the wall plot as has been the case with much of the box set, but again beneath the surface has a familiarity that long time fans will see. It also has the return of the singing nuns and Bernice getting drunk with the Mother Superior so what isn’t there to like????? Wry, ironic and silly – and why not – some of the very best Doctor Who stories are the silly ones, and this set has silliness in spades. But very very cleverly, the silliness and the avant grade take on Doctor Who masks a seriousness and a trauma that all the characters in this “Unbound” universe have been through, an awful total war that has pretty much ended their reality – so with hindsight the silliness is pure dark gallows humour. We are blessed to have David Warner as the Doctor, the old curmudgeon works a treat with the effervescent, witty Professor Summerfield and I hope that this is not the last we have heard of “Sam Kisgart” as a beautifully arch Master. 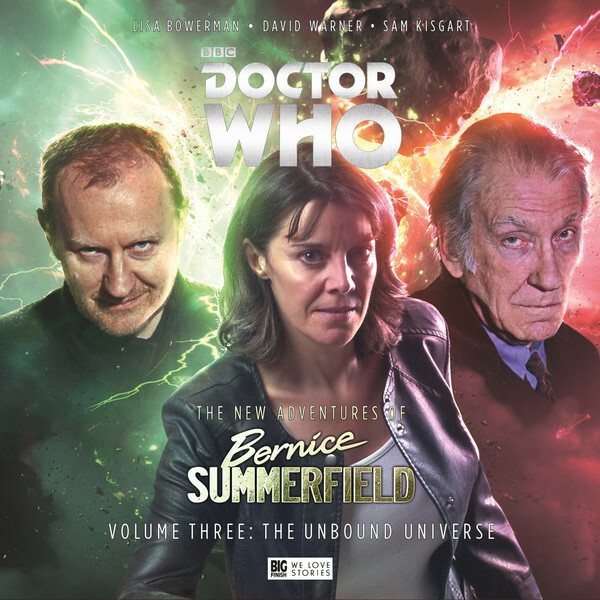 This really is a Bernice Summerfield set though and the first lady of Big Finish Lisa Bowerman continues (after nearly 20 years in the role) to astound as THE greatest companion that the Doctor has ever had the privilege of travelling with – and giving her a new Doctor and a new Universe to play with is a just reward for the longest running Big Finish character, and long may she be Unbound. A sideways take on Doctor Who, a full on new direction for Bernice – 9/10. This title was released in August 2016. It will be exclusively available to buy from the BF website until September 30th 2016, and on general sale after this date.